Mobile video and cloud solutions company, Skyfire has released an update to its iPad application that it says will make mobile browsing more “social, contextual, and useful.” With the release of version 5 of Skyfire Web Browser for iPad, it includes its browser extension platform, Skyfire Horizon, giving users the ability to customize their browsers how they see fit. Skyfire Horizon offers users a scrollable interface along with numerous toolbar extensions and apps, such as Facebook, Twitter, Yelp, IMDB, Amazon, Pinterest, Groupon, Google Reader, OMG!, ESPN, and many others. The browser now enables users to personalize their experience by giving them the option to add their favorite content to the app where it says anyone can “pin their favorite webapp or shortcut”. This platform is already available for its Android operating system. 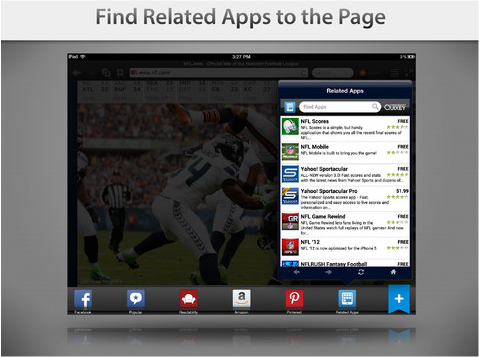 Powered by Skyfire’s partner Quixey, this app update is just for iPads. Within the app, if someone goes to ESPN.com, MTV, VH1, or anything else, what the company says should happen is that if a user clicks on the Apps button at the bottom, it can be shared to your friends and family through one or more of the multiple apps that currently support it. Once done, Skyfire Horizon, along with the Quixey integration, will parse the URL and any information on the page visited and return recommended-related Apps to that page. 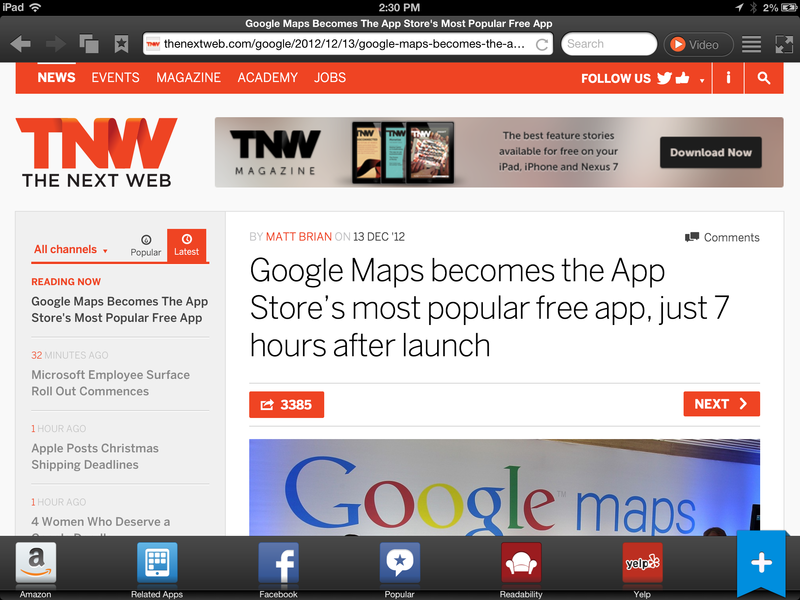 Known for being an alternative browsing source on the iPad compared to Safari, Skyfire is facing some stiff competition from the likes of Dolphin, Mozilla, Maxthon, Puffin, Mercury Browser, and many others. Besides all the tools and features it has, what probably draws its 2 million unique downloads is its ability to render Flash-based pages right on the iPad (something that normally Apple doesn’t like to display). Earlier this year, Skyfire raised $10 million in its series D financing round from Panorama Capital, Verizon Ventures, Matrix Partners, Trinity Ventures, and Lightspeed Venture Partners. Today it has a total of $40.8 million from the same investors.